Who Says Teens Are Lazy? Everyone complains about teens these days. Well, about an hour south of here (Oconomowoc) there is a group of teens we can all be proud of. Moringa Oliefera - and found it to contain an unusal number of substances classified as nutrients, antioxidants, other healthful biomolecules and substances new to Western medicine. And they continued the work on their own time! Since there was not sufficient class time to do a long term study on this plant, they decided to begin an in-depth research study on Moringa through their Science Club. In one phase of the study, mice with a fatal form of cancer were given Moringa and were found to be completely cured of the condition. The research was repeated several times!!! Each time the cancer cure rates in mice was very high. 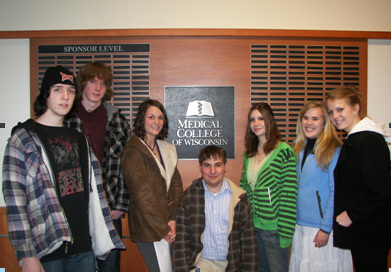 The Club reported their results to researchers at Medical College of Wisconsin. Upon reviewing the work, Science Club members were invited to the Medical College to meet with internationally known research doctors to discuss findings, evaluate the research, and communicate this discovery with other medical research labs. Their Science Club continues this work now in conjunction with researchers from all over the world. Who needs millions of dollars when we've got these kids? ...who has a masters degree in science and has been mentoring aspiring young scientists for over thirty years. I can hear the passion in his voice, although truly what his students have accomplished speaks for itself. Friends, I want to support these young people. Obviously they "get it". These are our future doctors and researchers. Mike has coached them well. I am so excited to watch them start their careers. They will do something with what they learn. They are doing the hard part, let us give them a boost with the easy part (money).